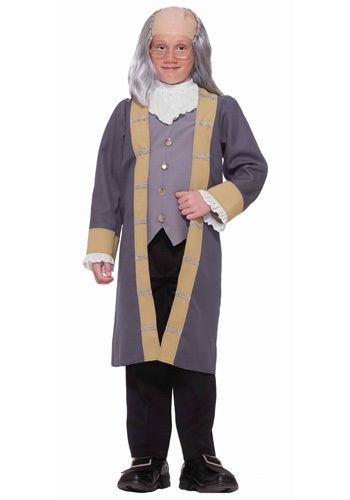 Your son has just gotten the part of Benjamin Franklin in his school play. You knew they were doing a play, and you knew he was going to be trying out, but he kept telling you that he was going to get the part of James Franklin, Ben's brother. But then he got the lead. And you were proud. Then he told you that the school won't be providing the costume. That was two months ago. He has been practicing his lines. Memorizing everything he can for proper immersion into the character. He has even started talking like Franklin. "It's called method acting. Duh." That's what he said to you when you asked about the extra research. Then you remember that you need to get his costume. Now it is the 11th hour, the play is just two weeks away. You need to find that costume, and you need to find it now. Luckily for you, we have this Child Benjamin Franklin Costume. It comes with the grey twill jack that Franklin is always depicted wearing, and an attached vest, just a lighter shade of grey with decorative buttons. And when your son asks where the electric clippers are, you know that you will also need to buy the Child Benjamin Franklin Wig to ensure your son doesn't shave the top of his head, then somehow figure out a way to dye the rest of it grey. Maybe he will pick up the old adage about early to bed, early to rise. Probably not though.